Visitez le centre commercial et culturel du Punjab lors de cette visite privée du temple d'or d'Amritsar et de la frontière de Wagah, déjeuner compris. Vous verrez deux des principales attractions de cette destination et en apprendre davantage sur les légendes sikhs et le mouvement de libération précoce de l'Inde. Cette visite comprend également un arrêt à la frontière Indo-Pak, où vous pourrez assister à la cérémonie du drapeau emblématique et très chorégraphiée. Guide Anil and driver Kasturi Lal were courteous, considerate and very efficient. They arrived at my hotel on time and nothing was too much trouble. The visit to the Golden Temple, and the Wagah Border Ceremony were great Anil helped me to get an excellent view of the extraordinary border ceremony as the Indian Border Security force men and women and the Pakistani Rangers face each other down across the gates with fast marches, high kicks and aggressive gestures, while a cheer leader rouses the huge crowd into an excited, patriotic fervour. One of the most memorable days I've ever had - not to be missed. The best part of the tour is Chander the guide he is a living walking encyclopaedia . It’s overpriced for the sites it offers . Dont opt if you don’t have VIP pass for the Attari Wagah ceremony . Lunch could be arranged in a better restaurant since it gives bad impression . We had a fantastic tour in Amritsar. The Golden Temple surpassed all our expectations - such a relaxing place to walk around with a lovely atmosphere. It was great to be able to see the kitchens and how this is a real working temple. The lunch at the local Kulcha Land cafe was excellent and one of my best meals in India! 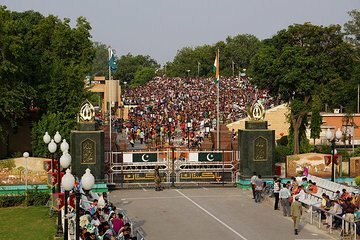 The Wagah Border ceremony was brilliant a must see if you come to this area. I would like to thank our guide, Gaurav, who was so informative and professional. He really provided us with an interesting and local insight into the city and India as a whole. Great tour. Very professional guide and driver and it is as its says on the description - highly recommend. I had an awesome time in Amritsar. I had to do it very quickly since it was a day trip for me. Nevertheless it all worked out as per the itinerary. Brilliant tour guide as well! Very good day. Indurdeep was a very friendly guy and easy to talk to. Golden Temple was incredible, pity we couldn't see the kitchens because of construction work. Indurdeep managed to get us on the transport from the entrance down to the seating area at the border which was a great boon in the heat. You have to walk back but it was much cooler by then. It was a fun experience to see and hear all the crowd there. Truly enjoyed all that Amritsar had to offer. Had a wonderful experience with our guide. We even got a chance to visit with a small farmer who shared tea with us before going to the Wagah Border. Amritsar is a great place to visit for anybody who is looking for a weekend getaway and would like to experience various aspects of Indian culture 1 religion - The Golden Temple, 2 history - Jallianwala Bagh, and 3 military at the Wagah Border. This tour was perfect and I would like to thank Anil for his hospitality and ability to get us everywhere we needed to go without any hassle.